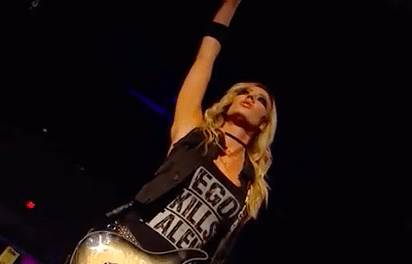 Halestorm frontwoman Lzzy Hale and Alice Cooper guitarist Nita Strauss teamed up together for a live performance on WWE Evolution. “WWE Evolution was a women’s professional wrestling pay-per-view (PPV) event and WWE Network event, produced by WWE for their Raw, SmackDown, and NXT brands. It took place on October 28, 2018, at the Nassau Veterans Memorial Coliseum, in Uniondale, New York. It was the first WWE pay-per-view to consist solely of women’s matches. 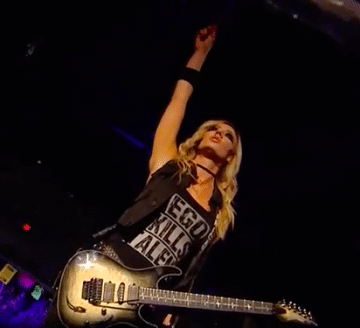 Lzzy Hale & Nita Strauss perform live ahead of WWE’s first-ever all-women’s pay-per-view event, WWE Evolution 2018: Courtesy of WWE Network. #WWEEvolution #Evolution Halestorm’s album Vicious is available now on iTunes and Spotify: https://apple.co/2OozPkP / https://spoti.fi/2qcRtNO Facebook: @OfficialLzzyHale of @HalestormRocks Twitter: @LZZYHALE of @Halestorm Instagram: @OfficialLzzyHale of @HalestormRock Nita Strauss’s album Controlled Chaos is available November 16 on iTunes and Spotify.